What about Mumble? It is free, open-source and has some cool features as positional audio support for BF1942 and in-game overlay (so you can see who is talking). 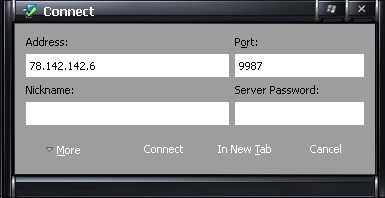 Btw, I set up a Mumble test server. So, if anybody wants to test it out, you're welcome. 2) Go to Plugins and check "Link to Game and Transmit Position"
2) Go to Overlay and check "Enable Overlay"
Sorry, this was a temporary problem, since Windows server PC lost the connection to network. Try now. Seems like positional audio doesn't work. Without it, mumble doesn't offer more than teamspeak. Also i agree with Stefan that with the few users of ts, positional audio wouldn't make sense. Do people still use server? What is the password? Make it a lot easier for players to join. I'll be on it when I'm on.